Scans are completed and Emily is stable. We are happy there is no progression but would love to have heard something different but it's stable. Some spots are decreased from Sholler's view but all of her spots are still there. It was a long day at the hospital and we got back in around 6. The best of this all is Emily looks wonderful. She is 33 pounds and she has lots of hair. We move forward. We start the long drive home tomorrow taking a break tomorrow night and will be home Saturday sometime. We come home to start Round 5 of the Avastin trial. Doing two more rounds and then back to Michigan for scans. Depending on how things look after round 6, we may put Emily back on the DFMO trial. At least that is what Dr Sholler suggests. We are always looking. Just a quick update. Hug and kiss your kids and tell them how much you love them. Stay strong and just keep your arms around your girls. You have many many people praying for your family. What a long trip this one is. 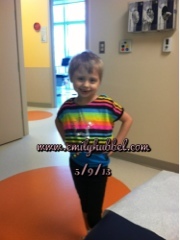 Continuing to pray for you Emily and for the next scans to be clear! Hurray for being stable, gaining weight and being together as a family!!!! Thanks for the update!